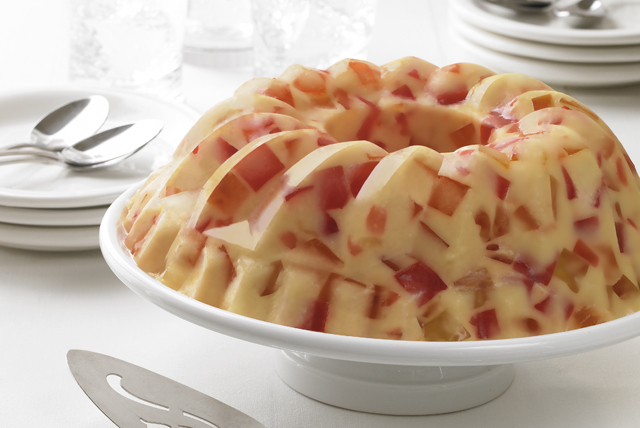 JELL-O Gelatin is made with milk to create a delicious creamy sweetened fruit flavor. Bring 4-1/2 cups water to boil. Dissolve strawberry, orange and 1 pkg. lemon gelatin mix each in 1-1/2 cups boiling water in separate bowls. Pour each flavor gelatin into separate 8-inch square pan. Refrigerate 40 min. or until firm. Cut into 1/2-inch cubes; refrigerate until ready to use. Bring remaining water to boil. Add to remaining lemon gelatin mixes; stir until dissolved. Stir in evaporated milk. Pour into 12-cup fluted tube pan or gelatin mold sprayed with cooking spray. Refrigerate 30 min. Add gelatin cubes to gelatin in pan; stir gently. Refrigerate 2 hours or until firm. Unmold before serving. To give this refreshing dessert a casual look, cut flavored gelatins into 1/2-inch cubes, then place in 3-qt. glass bowl sprayed with cooking spray. Add the cooled gelatin; stir lightly until well blended. Also, it can be made for individual servings. Spoon flavored gelatin cubes into individual dessert dishes; fill evenly with cooled gelatin. Refrigerate until set. If you've added the boiling water to the dry JELL-O Gelatin and cannot get the gelatin to completely dissolve, place the gelatin in a microwaveable bowl and microwave on HIGH 30 sec. This should bring up the temperature of the water to a point where it is hot enough to completely dissolve the gelatin. Stir until completely dissolved.